Playing with pattern and colour are probably what I like most about designing. Over the past few months, I’ve found myself thinking about this a lot, and considering the different ways that pattern is put to use in the colourwork of the designers I admire. 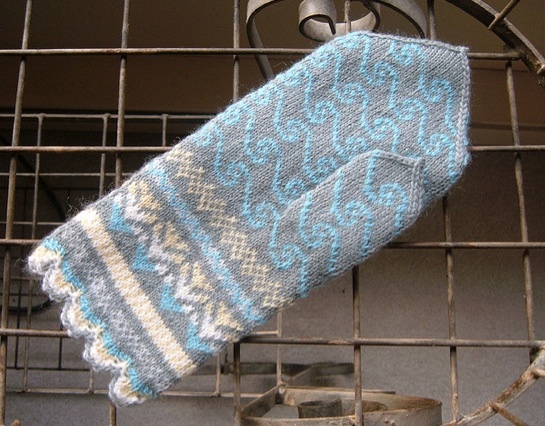 At the top of my list has to be SpillyJane – as someone who adorns mittens with pints of beer and sausages it would be hard for me not to like her – but there is so much more to her work than the witty motifs she weaves into her socks and mittens. Her aesthetic influences range from Pewabic Pottery to Flannery O’ Connor, and looking at her designs you can immediately see a creative intelligence at work. In her colourwork there is a grace, an energy, and a precision that I find both impressive and inspiring. I was really pleased that she agreed to this virtual conversation. KD:Where is your favourite place to sit and knit? SJ:Any place where I can hole myself up with a nice cup of tea, really. If I have to select a room at home I’d have to go with my yarn-stuffed studio up under the century-old eaves. On warm Spring and Summer days I love to sit on my porch and work in the sun, surrounded by greenery. 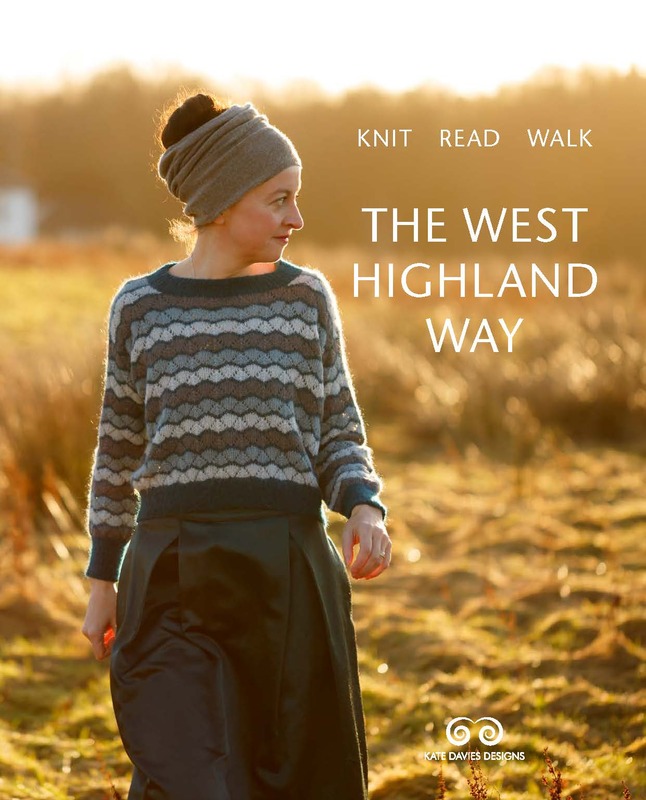 KD:When and how did knitting turn into designing for you? SJ:As soon as I realized that doing so would afford me the chance to play with colour and pattern. I’ve always been, erm, obsessed with both to the point of distraction. Also, there were things (mittens and socks) that I wanted to knit that didn’t exist yet — it was up to me to make them up, so I did. KD:What was your first stranded knitting project? 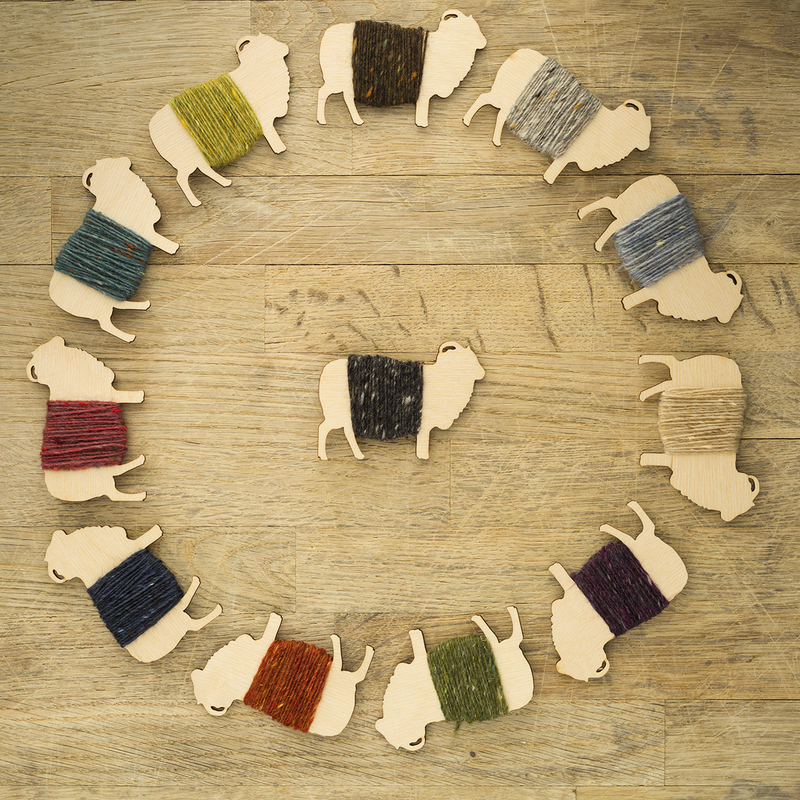 Did you enjoy colourwork right from the start? 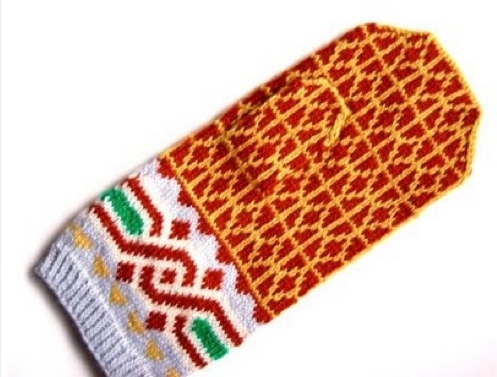 SJ:It was a Latvian mitten from Lizbeth Upitis’ fantastic book in wonderfully folky colours. Of course, I had no idea what I was doing — I didn’t know how to hold the yarn with both hands, the three-colour portions of the thing were a right mess and my stitches were way too tight. I never did knit the mate to that one — I treated it as a kind of learning experience and just tried to move on. 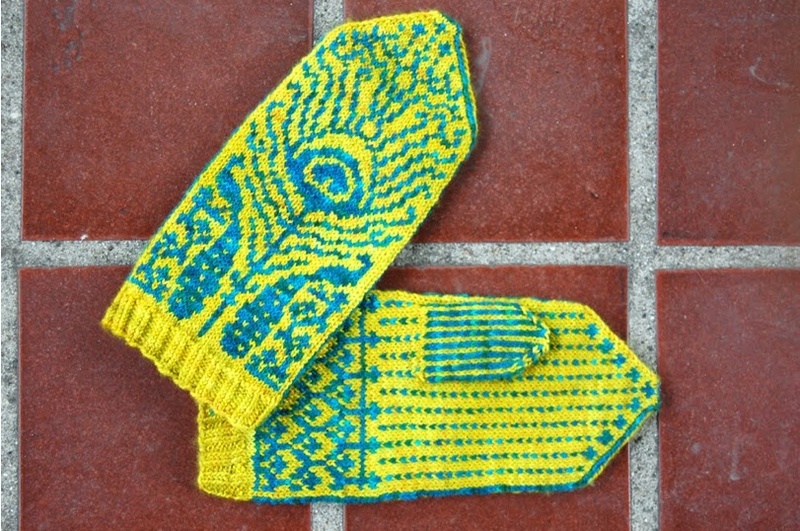 The next mittens I knit were my Sea Mineral mittens, the first pair that I designed. 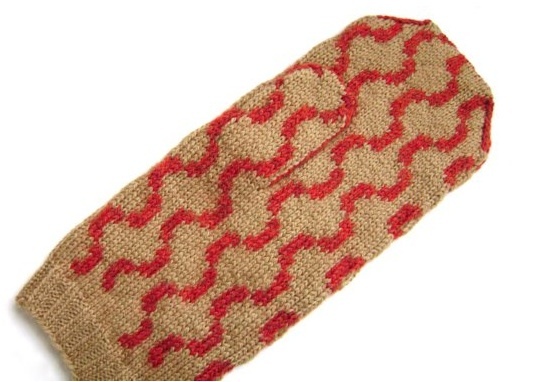 KD: I think Wurst is my favourite of all your mitten patterns — elegant chic and cured meat in one design! Really, you can’t go wrong. Which of your designs is your favourite? Why? SJ: I am so, so happy that Wurst is your favourite! I’ve always had a thing (as odd as it may seem,) for strings of sausages. That pattern is based on a stencil I had made years ago. I’ve always found hanging strings of sausage links wonderfully festive and earthy, especially at a busy market — I’ve always wanted to see them on fabrics or wallcoverings.
. . . My favourite of my mitten patterns is Decadence. Firstly, I’m in love with rich, deep colours — gold and plum being two of my favourites. As for the design, it initially appears decorative but subtly deviant poppy pods and absinthe spoons become apparent upon closer inspection. The palm is restrained and architectural, which invokes antique brass furnace gratings that might appear in a dark-panelled room where one might indulge in the aforementioned activities. It’s warm, cozy and vaguely seedy all at the same time. KD:On your blog, you describe design as a process of translation. Could you say a little more about this? SJ:With a lot of my work I feel like I’m just continuing the conversation that’s been initiated by my inspiration, but in a “different language,” so to speak. I’ll feel drawn to a song or an object or a building or whatever to the point where I feel the need to respond — to celebrate it, to announce my love for the thing at hand. So I’m very literally translating (carrying that thing over) into the realm of knitting. I hope people see my work and feel the need to respond to my pieces in turn — to keep the conversation going, as it were. KD:What do you enjoy least about designing? SJ: I get too many ideas all at once and I only have one pair of hands! 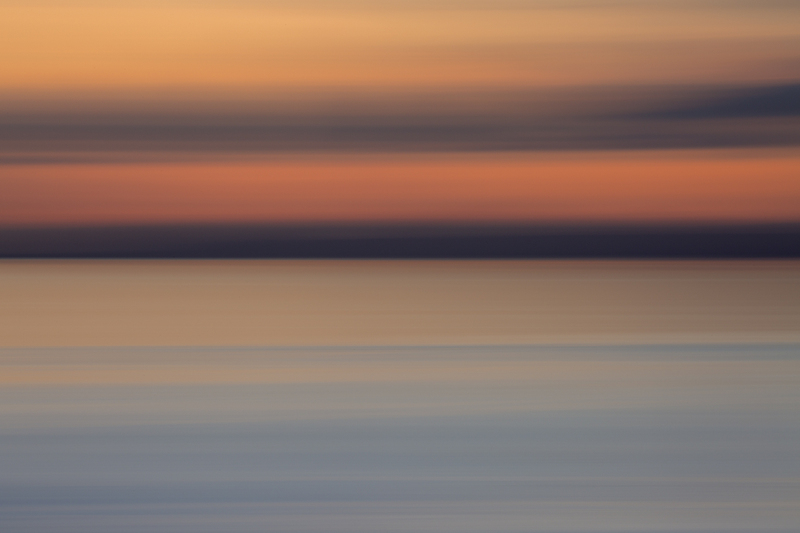 KD:I like it when happenstance plays a part in the way an idea for a pattern comes together. What was the most unexpected thing that has inspired one of your designs? SJ:I have always loved the Guardian Building in downtown Detroit, visible across the river from where I live in Windsor. 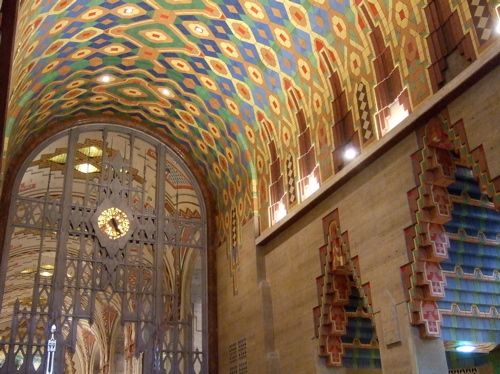 It is a beautiful red brick Art Deco masterpiece highlighted by bands of coloured tilework. When I started designing, it was delightful happenstance that my favourite building had bands of repeating tilework patterns that lend themselves perfectly to translation into colourwork stitches. KD:Is improvisation involved in your design process? do your patterns evolve as you knit them? SJ:I don’t improvise so much whilst knitting, but I do a little while drawing up the charts. I am constantly adding bits here and there, filling in empty spots or adding elements to make the design easier to knit, more aesthetically pleasing, or more balanced. I’ll look at the hard copy chart and move things around or flip things. KD:What often impresses me about your designs is the way that you can make complex visual ideas fit within the parameters of a mitten or sock. Your Flamingos are a case in point — combining vim with a sort of disciplined restraint. But do you ever find that your design ideas outstrip the basic possibilities of knitting? SJ: Sometimes I do. In such cases I modify the idea as much as I can, but if I can’t do so to my satisfaction I’ll throw it out before I compromise the design. The pattern can only work one stitch at a time, and adding too much detail can ruin the simple, folky beauty of the knitted pattern. At the same time, the design elements have to be recognizable. A flamingo has to look like a flamingo; if I can’t break it down to be used on a wee ten stitch grid and have it still be recognizable as a flamingo, I’ll move on to something else. KD:Is there anything you would never put on a mitten? SJ:Anything is game, as far as I’m concerned, but some things work better than others in a mitteny context. Some things just naturally lend themselves to being reproduced in miniature or in bands or in rows. It has to work within the parameters set by the mitten. I like these restrictions, they hem in the creativity while allowing me to stretch it to its limits. Contradictory yes, but I swear that this allows me more opportunity, not less. KD: Which designer / artist would you most like to invite round to your place for a pint and/ or sausage? SJ:Florine Stettheimer. I just became familiar with her this past summer. She was an American artist active in the teens, twenties and thirties. I am still learning about her. Her work is dreamy, airy and beautiful and I can’t understand why she isn’t more popular. Florine Stettheimer, Picnic at Bedford Hills (1918), Pennsylvania Academy of the Fine Arts. KD:Do you enjoy any other crafts? crochet? stitching? quilting? SJ: I enjoy spinning; I love my handmade spindles and find the whirling hypnotic and relaxing. I have dabbled with embroidery over the years, and enjoyed a brief flirtation with Elizabethan stumpwork. Very inspirational! SpillyJane moves me to make mittens and to try designing my own. I love these mittens! They are beautifully crafted and so full of charm and whimsy. I wish I were a more speedy knitter so that I could make them all! Thanks for the insightful interview with Spilly Jane. I love her designs, whimsical and beautiful. I have several of her designs in my knitting queue. What a lovely thoughtful interview! i have been following the delightful SpillyJane for a while now, but am happy to know more about her…thank you! Thank you for sharing this conversation. It is fun to learn more about Spilly Jane and her wonderful work. What a wonderful conversation–I am really taken by these designs and I must also say that I can see a real affinity between the graphical quality of some of these patterns (e.g. the fish and the flamingos) and some of your own designs (for instance, the hare and tortoise pattern). Something about the neatness of their interlocking shapes and their aesthetic economy really makes me want to try knitting these patterns and also perhaps to try designing something myself at some point. Thank you so much for a great posting! I wish I had 8 arms like an octopus so I could wear more mittens. I gave my son’s old girlfriend mittens 2 yrs in a row and she had trouble understanding why she needed a second pair.And I had to make my sister a second pair because she hung the first one pair on the wall because they were too pretty to use. what a beautiful post to cheer the soul on a cold evening! 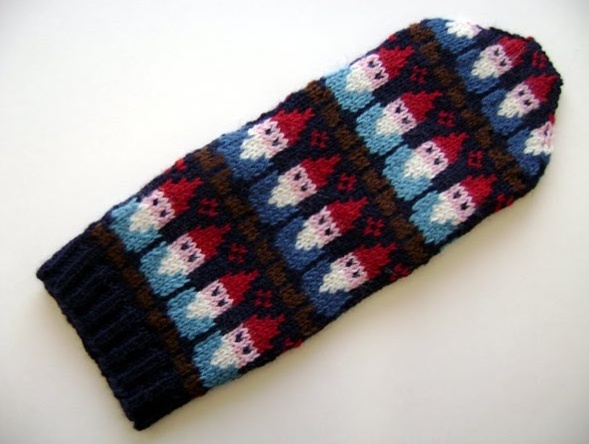 I love all of the mittens… the only tricky thing is deciding which pair to make first! 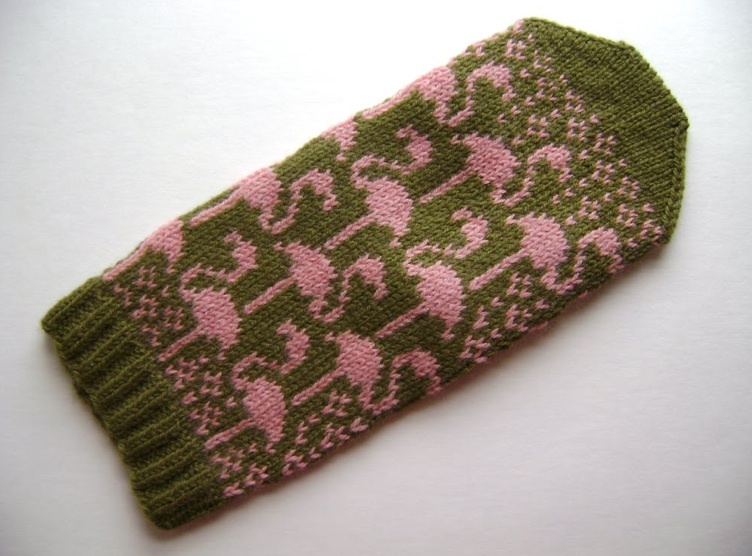 I love spillyjane’s designs and hadn’t realised she had done some GNOME mitts. Be still my heart. Thank you for lovely interview and really interesting to think about how people design things and think about colour and pattern. 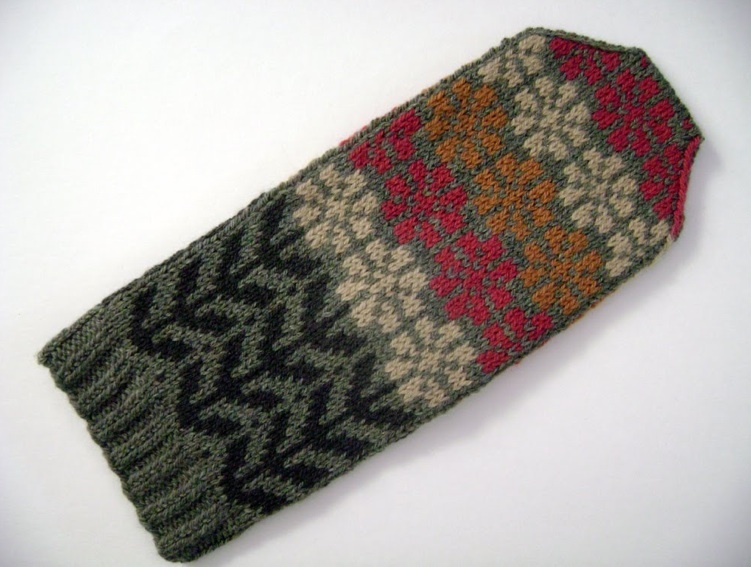 Colourwork is fascinating and very addictive, I am aiming to try and knit looser colourwork. I love the designs on the mittens, especially the peacock feather, and the flamingo’s. 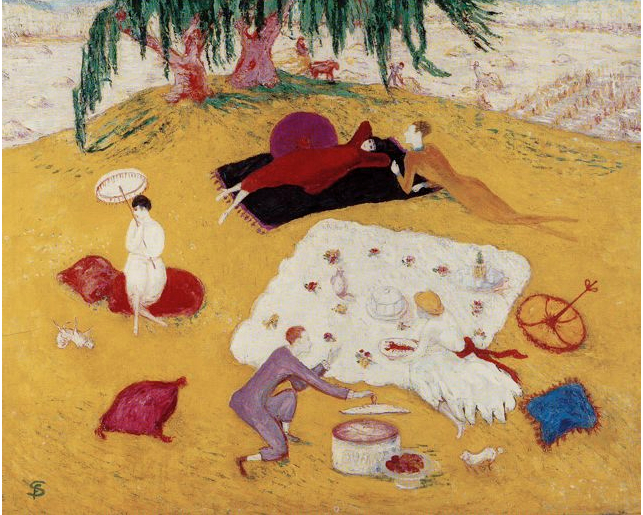 I also could just imagine your Bruce bounding across that picnic scene by Florine Stettheimer, Picnic at Bedford Hills. Very interesting interview. Great designer, great article. Thanks for sharing! 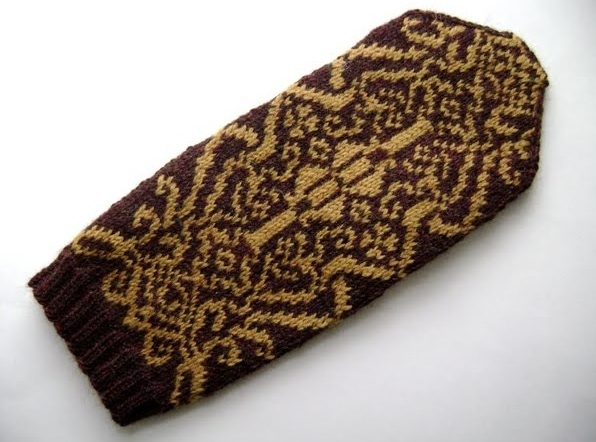 I love Spillyjane’s fun Fair Isle motifs. It’s fun to hear what influences and inspires others. I particularly like the gnomes. I have tent gnomes that decorate my campsite when I camp with the troop. Great post and interview! Kate. Wonderful interview, thank you so much for all the beautiful pictures. All I want to do now is knit every one of these mittens.So inspiring. Thank you so much for this conversation! 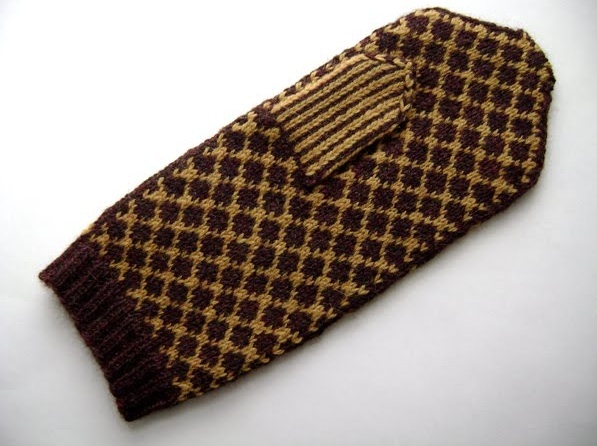 I am a fan of SpillyJane’s mittens, too, so it’s fun to learn more about her as a designer! Outside is minus 18 degrees Celsius, so mittens are a must! As a P.S. I first discovered your blog through Spillyjane’s, where she lists you as one of her favorites and immediately fell in love with your style and designs! Thank you Kate! I first experienced Spillyjane through her cupcake mittens that I stumbled upon accidentally and have been a huge fan ever since. I know there will always be a delightfully new surprise for me at least once or twice a month on her blog, though I admit I visit it daily just in case. Thank you for doing the interview and expanding my knowledge of one of my favorite designers and thank you Spillyjane for being such a creative force in the knitting universe! This was a great interview and I loved the mittens. Wonderful interview, wonderful designs! I love love love the part about continuing the conversation in another medium. And as a Detroit resident I got a special thrill seeing Pewabic Pottery mentioned and almost spit out my tea at the sight of the Guardian Building! One of my favorite places in the city. We should organize a mitten KIP session at the cafe there, perhaps (once I finish some of the five or six projects I have on needles right now). . .
I’ve also been trying off and on to design a stranded motif of chickens, that’s small enough to be on mittens (or a vest?) but large enough that they are recognizably chickens (and possibly with more than one color per chicken – perhaps red feathers on the tail and head of a brown-bodied rooster? and yellow feet?) Haven’t quite managed it yet. Holding the yarn in both hands – I knit the continental way as I was taught by my Hungarian mother and grandmother – and I kind of worked this two-handed method for stranded knitting out for myself years ago when I was getting frustrated making a Shetland pullover, and combined the English and continental methods so that I could go faster. I’m delighted that I actually did something you’re supposed to do! In those days, it wasn’t nearly as easy to get tips as it is now on the web. My favourite is Wurst, but they’re all lovely. Thank you for sharing this conversation. What a great interview! I’ve always loved her whimsical designs especially (Swedish Fish, Gnomes, etc. ), but I’ve been terrified of colorwork. I may just have to give it a try! Enjoyed reading your interview with Spilly Jane and seeing all the beautiful designs. I think my favourites are Isadora and Ploska and the Gnomes had a seasonal look to them. Hey! What a lovely, inspiring, informative post. Thank you both so much. Thanks, Kate for drawing my attention to Spillyjane. I’ve seen (and loved) the flamingo and mystery and manners mittens, but never noticed they were from the same designer. Thank you so much for ‘introducing’ me to SpillyJane. The photos are so inspiring – both the mittens and the art. What a clever woman! 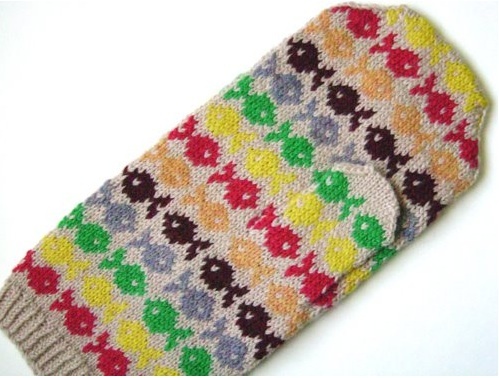 And what stunning mittens (they’re the kind you’d put on even if it was searingly hot outside!). 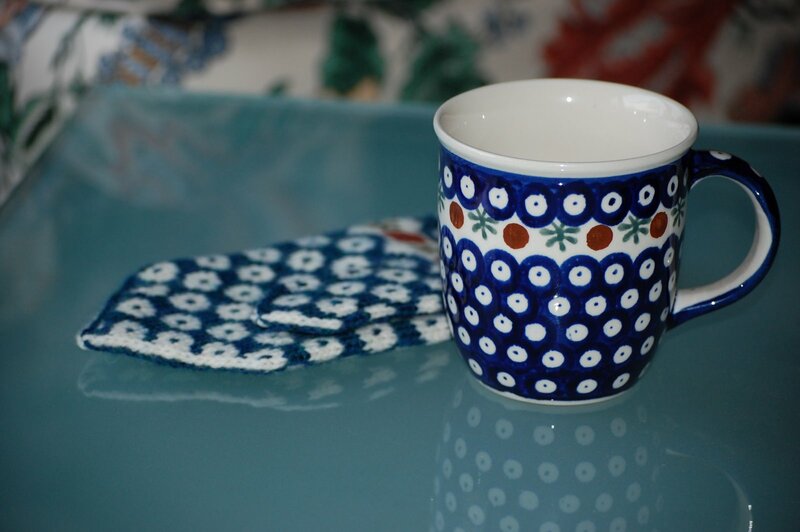 I love the Polska mittens, inspired by the ceramic cup – that is just brilliant. Thank you for bringing to us such a fascinating chat – I’m in awe! So fun! I remember when I first saw the fishy mittens…I’ve been a fan of SpillyJane ever since! Love SpillyJane, love her designs. Thanks for posting this interview! Thank you for such a delightful interview. I learned so much about one of my favorite designers. Kate, the interview looks wonderful! Thanks again, so much! Thank you for introducing me to SpillyJane and her designs – a few went directly into my favourites! B) that I didn’t live in South Carolina where mittens are needed about once every other year.